Fast rising rapper Fancy Gadam is set to rock the Gadam Nation concert scheduled for November 6, Sunday at the National Theatre. The young northern artiste burst onto the mainstream scene earlier this year after making headlines when he sold out his album launch at the Tamale stadium. Building on that momentum Fancy Gadam has performed alongside some of Ghana's biggest acts like Stonebwoy, VVIP and more. Fancy recently gave a spectacular performance at the just ended Stonebwoy Peace Concert held in Ashaiman. Since then, he has been steadily building on his success as he recently sealed a deal with Rush Energy Drink at an undisclosed amount as the brands Ambassador in the three Northern regions. Artistes billed for the night includes Ataaka, Nandos, Iwan and Saani among others. Gadam Nation concert is a show put together by 5PM and Gadam Nation, which is expected to be another night of thrilling music display. 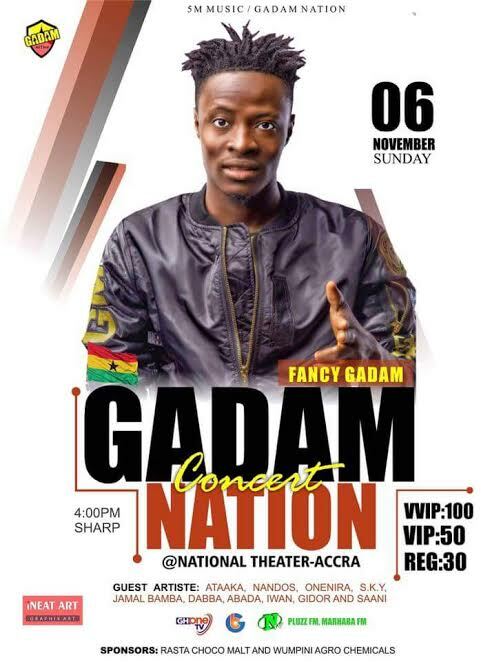 The show happening at the National Theatre promises to be another exciting Fancy Gadam show. Ticket for this event is selling for; GHC50 VIP and GHC30 Regular. Follow Fancy Gadam on Twitter @fancygadam2 and Fancy Gadam on Facebook or call 0509897093 for more information.